What Do You Know About Your Feelings Of Awe? R2(on right) and cousin use the “awesome” view of the Alps from outside Filzmoos, Austria as a backdrop. I have heard that many who attend church and believe in God, get a feeling of awe and know they are in the presence of God while at church. I don’t doubt they think and/or believe that God is the cause of their awe, but I know I have had such feelings when I’m nowhere near a church. As I have stated in an earlier post, I’m unsure of what to believe regarding God and religion and therefore, assume I’m agnostic. In fact, I wrote that post attempting to explain my beliefs or lack thereof. Let’s explore this feeling of “awe” that was mentioned earlier. I’ll admit that when I attend a church service and the congregation is, in unison, chanting and singing, that I get a feeling which is best described as joy, glory, or yes, awe. Now, when I see a majestic mountain, a beautiful rainbow or a painted desert scene, I also have an awesome experience. Of course, all of these are the direct products of Mother Nature and often times are directly attributed to God. But, what about the feeling of awe that I have when I see the St. Louis Arch? Or, what about the awesome feeling I have when I see a good uplifting movie? My point is that just because a feeling of “awe” is experienced, there is no way for that to be proof of the presence of God. Before I go any further, I would like to explain my feeling of awe. It isn’t always the same and words seem inadequate. Sometimes, there is a sense of lightheadedness. Sometimes, there is an overpowering sense of warmth going through my entire body. Sometimes, it is an uncontrollable urge to smile. A specific example where I had all three of the previous descriptions of “awe” occur was when I saw the majestic Alps from the small ski village of Filzmoos, Austria. 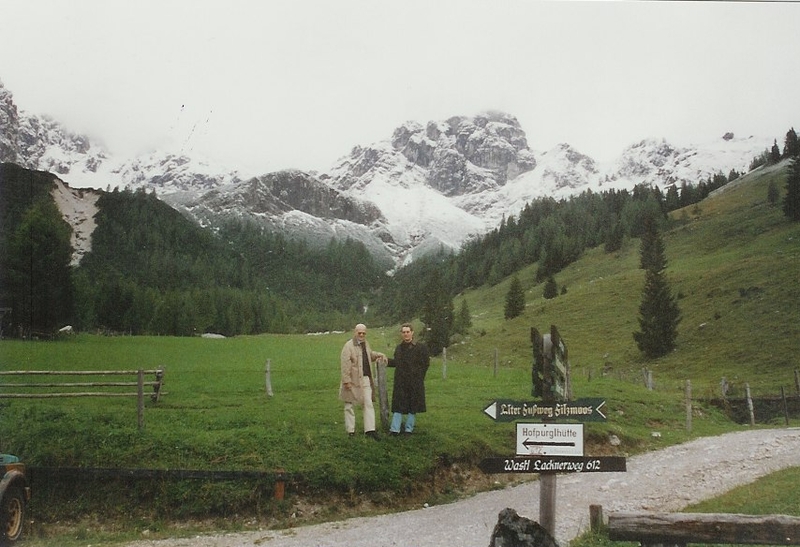 My wife and I were there in September of 2001 with relatives who usually visit the village during ski season. Of course, there wasn’t any snow in the village at that time of the year, but the mountains that surrounded it were snow capped and “awesome.” That visit stands out in my mind as a time when I had this feeling of awe and I knew, at the time, that I would most likely never experience anything quite like it again. NOTE: The picture at the beginning of this posting is a small example of what I saw, but of course, doesn’t capture the entire feeling. Of course, I have had and will have more feelings of awe, but I’m sure they will be considerably different than that one. Was this feeling reflecting the presence of God or the presence of an uplifting sense of self where I felt this was a unique special time in my life? I think the latter. This entry was posted on Thursday, September 17th, 2009 at 1:00 am and is filed under R2, Religion, Ron Rogers, Writing for learning. You can follow any responses to this entry through the RSS 2.0 feed. You can leave a response, or trackback from your own site. 4 Responses to What Do You Know About Your Feelings Of Awe?